The EOG has recently been taking tentative steps into the sprawling universe of Worldspanner’s Duel of Ages II, from an unboxing video to a review and, of course, the inevitable rules summary and reference. Now it’s time to sit down and have a chat with its creator, Brett Murrell. EOG: What came first when you designed Duel of Ages, the mechanics or the theme? They evolved in parallel. The theme began with the Worldspanner universe storylines and a set of RPG rules years back. Duel of Ages as a board game came later, taking the Worldspanner backstory and using the backbone of the RPG game round and character rating structure. EOG: What influenced the theme—movies, books, comics etc? A youth spent devouring fantasy and scifi—Bova, Saberhagen, Laumer, Brooks, Asimov, Lewis, Tolkein, etc. Where I grew up there was only one television station where we lived, so it was books or nothing. As those who have played Duel of Ages or read the Spire books (Dusties and Devourers) know, Worldspanner is a pretty unusual world that doesn’t fit anything else else out there, so I’m certain that my early reading primed the pump. EOG: What kind of games do you enjoy? If so, any favorites and why? Were any a particular influence on the development of Duel of Ages? I grew up on wargames and classics like Dune, Titan, Up Front and Gunslinger. I wrote for The General magazine and was involved in the Squad Leader rules compendium before that was superseded for Advanced Squad Leader. That experience gave me a desire to distill a tactical game mechanic down to a thoroughly streamlined method that anyone could pick up quickly, even those who weren’t wargamers or even gamers. That aspect found its way into Duel of Ages. Nowadays, when I get a chance to play, I enjoy cooperative thematic games like Shadows Over Camelot, Pathfinder and Legends of Andor. EOG: Legends of Andor has a similar method of introducing the rules to the player with scenarios that increase in rules complexity. What do you think about this way of writing rules? Any thoughts on rules writing in general? Rules writing is extremely challenging. The greatest difficulty is finding people to proof it for content. Once a person has played the game, they will read into the rules what they know, and they are blind to gaps. In Duel of Ages II, we chose to use a programmed learning method for the paper rulebook, and then provide an electronic master compendium on the website. That way you get both types of rulebook. Having it electronic is good because then you can tweak it and make it perfect using all of the additional input. We’ve been happy that we do not have a single errata or rule change with all of the game’s content, but we have modified wording to make rules clearer, especially for second-language readers. Some players dislike the programmed learning approach, but they can still learn the game while grumbling. There are players that would never learn the game without the programmed learning, so that’s why we went that direction. I don’t want players to notice mechanics during play. Mechanics should fade into the background as simple, natural actions. EOG: Any new mechanics/innovations in the game that you’re particularly proud of? Why? The game round structure creates a highly realistic representation of conflict without a molecule of unnecessary bloat—which to me is a big achievement. But the real innovations are the map structure which interlocks and naturally distributes points of interest, the Dome dismissal cycle that causes the situation to change tactically every turn, and the very simple but effective standardized challenge system. All of these serve one main purpose, which is to make game play natural. I don’t want players to notice mechanics during play. Mechanics should fade into the background as simple, natural actions. EOG: The expansion material is very much ‘more of everything’ rather than new or expanded mechanics. Was this a conscious decision? Definitely. 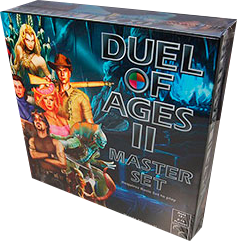 The first version of Duel of Ages had eight boxes, and the first set was more of a taste of the game. For version II, we made the first set Everything. That was important. You can play the version II ‘Basic Set’ forever and never need any more. But, the Master Set is there for you if you want more. Duel of Ages II contains 1445 individual pieces of art from 32 artists and 10 countries, produced over a period of 12 years. It represents the game’s virtual arena of the future, and therefore 3d art made the best representation of the not-quite-reality atmosphere. However, 2d illustration was used for most characters of the Ancient and Colonial ages to give them a different flavor from the rest. I like 3d art and good, detailed 2d. Graphic designers such as yourself will find discordance here and there, but as small press I am flattered when Duel of Ages II is compared to the big boy game packages with their much fatter budgets. I personally like the different, unusual feel of the game. It fits the game’s maverick nature. 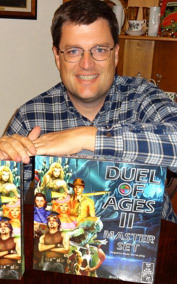 Duel of Ages enjoys a special position in that there is absolutely nothing like it among tabletop games. That’s one of the most powerful appeals of the game—it truly is a totally new experience for players. But that is why people in general should not get the game. It is definitely not for everyone. The game contains a great deal of carefully orchestrated chaos, confronts players with failures and difficult challenges, and is intended as a night’s entertainment by itself. Players who like things in total control, or who are allergic to failures, or expect games to be short may not find this their cup of tea. EOG: I find the absolutely unapologetic way you talk about the game to be fascinating—you’re obviously so confident and happy with the game that it’s the gamer’s responsibility to discover and enjoy it, not yours to market it to gamers. It’s really refreshing in this age of marketing spin and worn-out genre rinse-and-repeat, and it bespeaks your unabashed love for the game. What do you think of the contemporary boardgaming scene in general, in light of your unusual approach? Competition is always a good thing. It results in improvement and it makes lazy, selfish humans get off our duffs and do better. That’s one aspect I admire in the industry. Anyone can put their hat in the ring and legitimately compete. Here we are at tiny Worldspanner, sitting among the industry big dogs with one of the top games of 2013 (a year that saw over one thousand new games not including expansions) and with sales that many larger releases never see. The industry’s games are getting better because they must in order to compete, and all attempts at “zeitgeisting” (making games go an approved direction) fail. Where you see true zeitgeisting is on the shelves of Target and other large chain stores. That’s where there is limited competition and therefore limited improvement. EOG: Any plans for the future you can tease readers with? What’s next for Wordspanner? Worldspanner is a universe, of which Duel of Ages II is only one aspect. 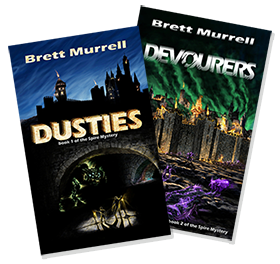 The current push is to complete the five-part Spire series, of which the first two (Dusties and Devourers) are published and found on Kindle and Amazon in electronic and paper. The books have longer legs than Duel of Ages, as they appeal to a much wider audience (teen/adult adventure/romance/mystery) and have that sense of excitement and unusual adventure that Duel of Ages presents. We’ve been surprised by the enthusiasm for the books, and we can’t let that lapse by distractions elsewhere until the series is done. Once the series is complete, this will then cycle around to added Duel of Ages expansions and two cooperative games in the works—but both of those games require the Worldspanner universe to be expanded through the fiction. EOG: As someone who came into the game with no prior experience, I felt that the universe was only touched on in the rulebooks, and that there wasn’t a sense of it being more than a rough concept to set up the game (some things, like Lith, come completely out of left field with very little explanation). Obviously this isn’t the case and there is a lot of background material. Do you think this could be better communicated to newbies in the game rulebook? Not everyone is going to go to your website to discover more. You hit on an interesting secret. In Duel of Ages version 1, we went into detail explaining the background. We discovered that it got in the way. In Duel of Ages II, we devote the first page of the rules to a simple immersive story, and leave it at that. And it actually worked. Lith is especially interesting, because with almost no explanation, most players picked up the queen mother idea in their heads, and we let the bacon tribute do the rest. Some players really care about and enjoy the background story, and they have plenty to read with the card content and the book series. The website actually has very little backstory currently. For the other players, the backstory does not get in the way, and that worked better. EOG: Any plans to revisit the RPG? Eventually, but an RPG requires a fully developed background universe, and that is why the current push for completing the first novel series is critical. EOG: The game is over a decade old now. What about it do you think is responsible for its longevity? In what directions do you think it will develop in the next decade? I like this question, as it uses the term “next decade.” I dislike the business model of pumping out games—whether they are ready or not—to keep the hype going. Because of the exceptional replayability of Duel of Ages, it creates its own longevity, without the need for constant industry hype. That’s why we call it the Award-Winning, Best-Selling, Unknown Adventure Game. We’re not interested in rushing things, and our current plan line extends for the next twelve years. EOG: Thanks very much indeed for talking with the Esoteric Order of Gamers, Brett! Thanks, Peter—enjoy the southern hemisphere for me. If you are one of the many people for whom Duel of Ages II is your proverbial cup of tea, be sure to check out the official website for information, resources and discussions!